Each spring, the big three Orlando theme park resorts host a themed concert series to help boost attendance. Walt Disney World promotes the seasonally-appropriate EPCOT International Flower and Garden Festival, while SeaWorld offers guests a taste of relaxed southern comfort to go along with their Bands, Brew & BBQ. 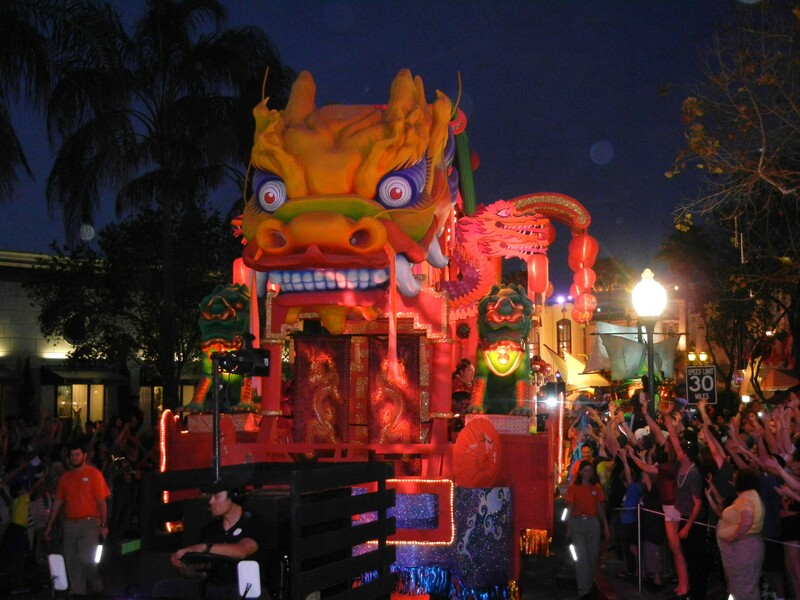 Universal Orlando; however, parties a little harder with Beads, Beers and Big-name acts at their annual Universal Studios Mardi Gras Grand Celebration! When people think of Mardi Gras, they think of a wild party. Even if they've never actually attended the New Orleans celebration, a majority of the general public knows what to expect from the annual event: great music, a fun crowd, and tons of beads. Therefore, Universal Orlando gets to benefit from built-in marketing because their Mardi Gras-aware guests are already preprogrammed and ready to have a great time. The Mardi Gras Parade brings Bourbon Street to Orlando with a dozen extravagantly decorated floats escorted by dancers, stilt-walkers and costumed horses. 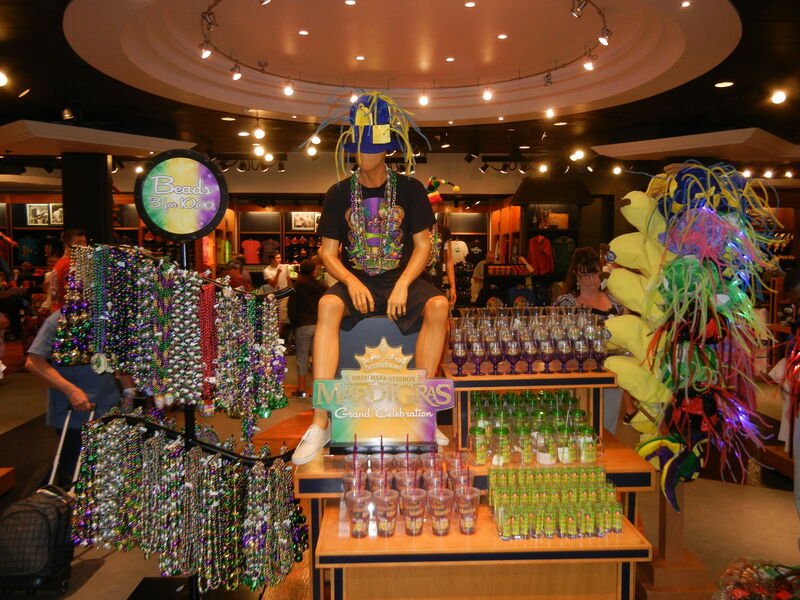 Like traditional Mardi Gras, guests get to experience the same thrill of catching handfuls of colorful beads. Unlike traditional Mardi Gras, these beads are free and not earned by exposing flesh. I was fortunate enough during the parade to not only keep my shirt on, but also snag a few mid-air catches due to my height and lack of surrounding competition. I handed my hard-earned rewards to my wife while she stood back to avoid getting trampled by the frenzied crowd. Mid-way through the parade, I noticed a nearby dad with his daughter on his shoulders failing in his attempt to catch her a beaded prize. For some reason, they were having the worst luck. Each throw would either fall short of his reach or soar high above her head. They were desperate and time was running out. Now, I completely understand the natural human desire to want free stuff. Just like catching a fly ball or getting pummeled by a jersey from one of those t-shirt RPGs, the competitive thrill and subsequent glory of being the one guy to catch something in a sea of people is intoxicating. So much, in fact, that people are willing to sacrifice their bodies and the bodies of those around them to achieve it. Most of the time, the stuff being thrown at crowds is garbage. This Mardi Gras parade was one of those times. Everyone knows these beads are worthless outside of the context of the parade. They cost nothing to make, and we all do the same thing with them once we get home: either toss them in the trash or dangle them off a shelf as a reminder of how seldom we get to party. That's why I'm of the belief that these beads have to be earned to achieve any kind of represented value, and the only decent way to earn them is to catch them... yourself. That being said, the "sad dad" next to me was about to have an equally sad little girl when the parade ended and she didn't have any bling. Sympathetically, I stopped catching beads for myself and started covertly assisting this guy in making his daughter happy. First, I tried waving at the bead-throwers and directing their attention to the little girl. Some of them noticed and tried their best to toss her way, only to be intercepted by a group of D-bags stationed in front of her. That's when I went on the offensive. I made a hole with the help of a few like-minded allies who realized what I was up to. Eventually, I was able to successfully slap one of the last thrown beads into the dad's hands. As the final float passed, the crowd scurried to get to the concert area. Through the congestion, I managed to witness a shared hug between a proud daughter and her hero daddy. My wife asked me why I didn't just give the girl some of the beads that she was wearing. I told my wife that it wasn't my job to be that girl's hero, it was her dad's. Also, referring to the beads, I reminded her – like Tom Hanks to Matt Damon at the end of Saving Private Ryan – that you have to "earn this." 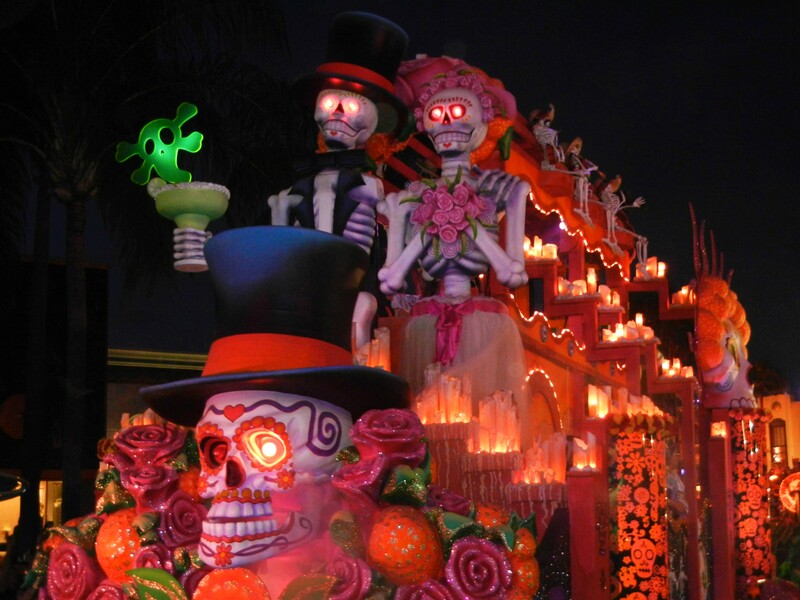 Each parade allows a few special guests and families the opportunity to experience the parade from the floats by tossing beads to the hungry crowds. Unfortunately, not all of them have the best throwing arms. On our way to the Universal Music Plaza Stage, we saw more beads in trees than we did around necks. 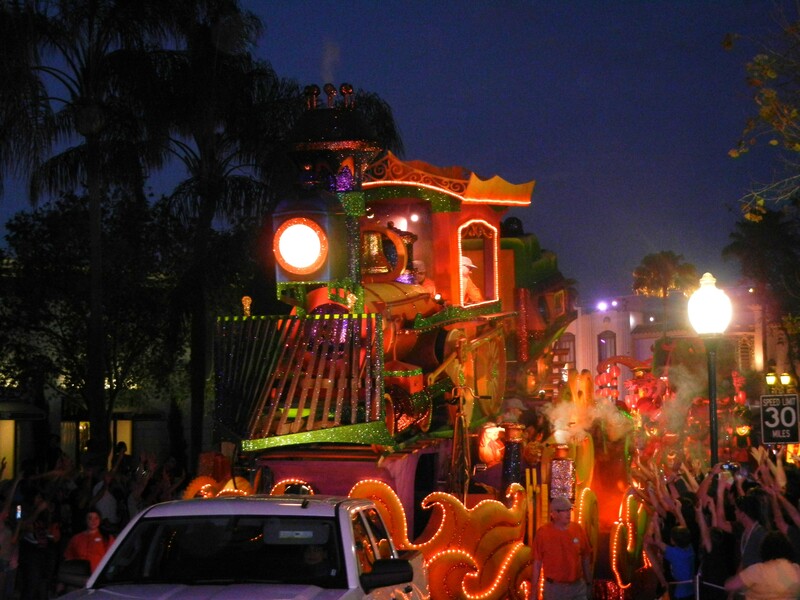 By adopting the well-established, anything-goes attitude of Mardi Gras, Universal Orlando was free to focus less on explaining what their event was about, and more on booking quality bands and artists to rock the crowds at night... and that's just what they did. While Disney chose to stay in line with their theme by exclusively booking acts from the 60s and 70s for EPCOT's Flower Power Concert Series and SeaWorld managed to be blessed with support from country acts and comedians, Universal has invited artists from across all musical genres to perform for their guests. Ranging from classic groups like Huey Lewis and the News, Foreigner and Kool & the Gang to contemporary chart-toppers like Cody Simpson, Nelly and Robin Thicke and fan favorites like Weezer, Daughtry and Gavin DeGraw. Our hustle and crowd-negotiating skills landed us front and center for the Gavin DeGraw concert that night. We had both never seen him perform live before, but his music has meant a great deal to us, personally. His 2003 debut album, Chariot, was the soundtrack to the early days of our relationship when we met in August of that year. So, this was understandably a special experience for the two of us, not to mention a rare date night for these parents of two. I have to shout out thanks to my brother, Erich Dale for hooking us up that night. Thanks again, bro! Best known for the One Tree Hill theme song, "I Don't Want To Be," DeGraw and his band interchanged between classic songs and current hits. He performed all of his most popular singles, "Chariot," "Follow Through," "More Than Anyone," "We Belong Together" and the thumping new release, "Best I Ever Had," among others. It was a lively and enthusiastic show that included a tribute to Billy Joel with a rendition of "She's Always a Woman." The show lasted a little over an hour and was followed up with an encore performance of DeGraw's 2011 hit, "Not Over You." After the concert let out, everyone was asked to exit the park and begin the mile-long exodus to the parking garage. The crowd was still electrified from the show, so it was a brisk walk. 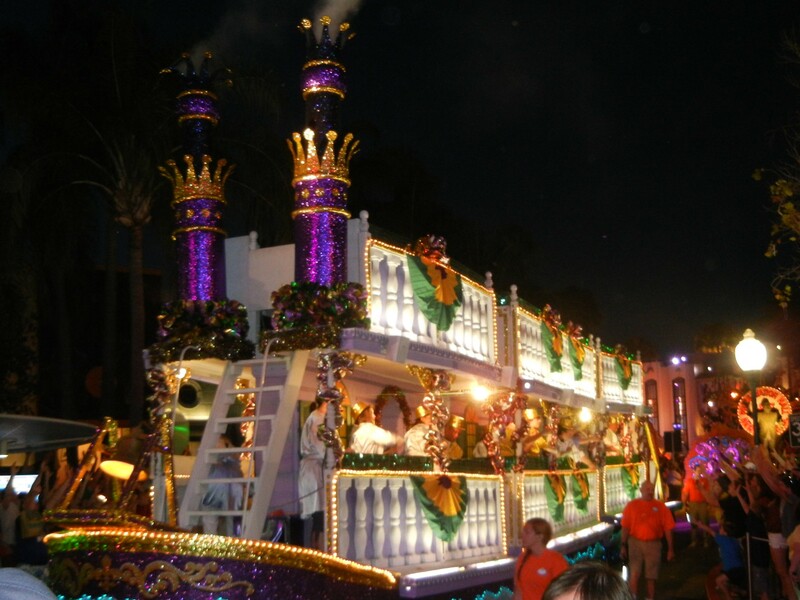 Other than the parade and concert, the Universal Studios Mardi Gras Grand Celebration offers authentic Cajun cuisine and Zydeco music at the French Quarter Courtyard. I'll admit that I didn't arrive until after 5 pm, so I didn't get to enjoy the full experience. 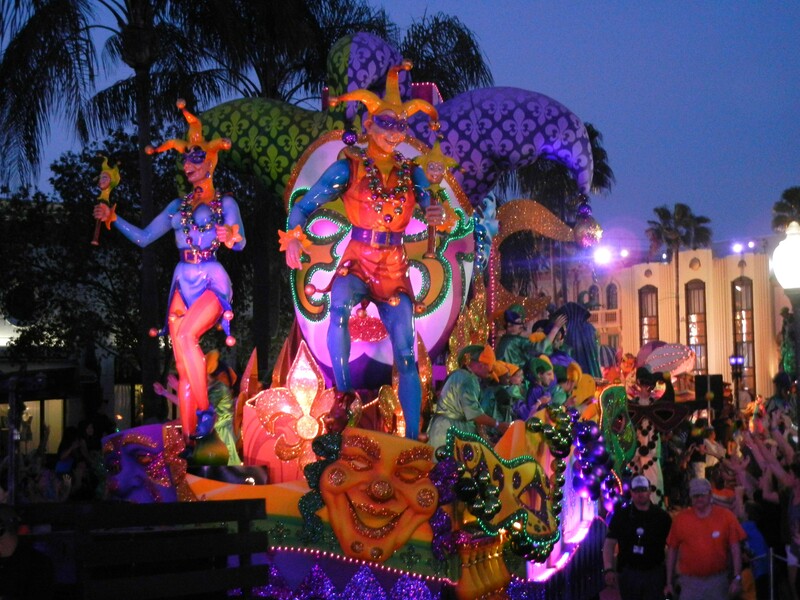 One of the perks of attending Mardi Gras at Universal Studios is that both the event and concert are included with the cost of a regular day admission. That way, guests can spend the day riding the movies before the sun sets and the good times really start to roll. When the parks close, guests can keep the Mardi Party going at Universal CityWalk! First grab some drinks and at Fat Tuesday on CityWalk's upper level. Then show off your beads and your singing abilities at Rising Star Karaoke. Finally, grab some late night grub at the BK Whopper Bar, where you can build your own Whopper burger!